PSUs Recruitment Not through GATE – There are many Public sector undertakings (PSUs) which are recruiting every year through GATE. If you did well in your GATE exam you would be able to join any PSU after GD/PI as per your performance in GATE exam as well as GD/PI. Around 10 lakh candidates registered for GATE exam every year. 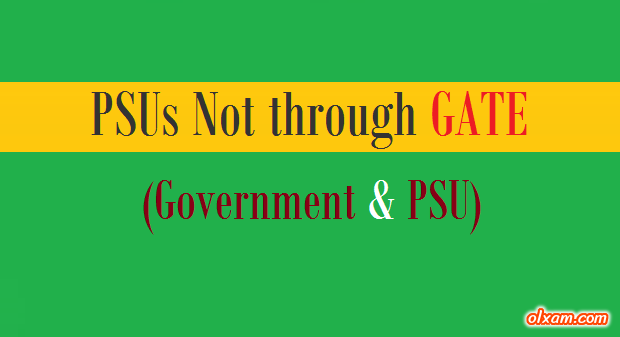 It is obvious not every one will qualify GATE and not every one will select in PSUs through GATE. What if you didn’t able to score good enough to get call from PSUs ? Now such candidates need not to worry much, there are many PSUs and Govt. organizations which are recruiting but not through GATE, by conducting their own examination than GD/PI as per their requirement. If you didn’t perform well in your GATE exam but prepared well for GATE then you can use that preparation for such PSUs/Govt. Organizations examinations now. Nowadays Government organization and PSUs are being systematic in their recruitment process. Many Government organization and PSUs are recruiting nearly every year through their own competitive examination. Like Indian railways, India’s one of the largest working group with largest number of employee, releasing notification of recruitment after almost every 1 or 2 year. So, those candidates any how were not able to perform well in GATE exam do not worry much prepare well and keep your preparation continue there are many exams which are not through GATE. 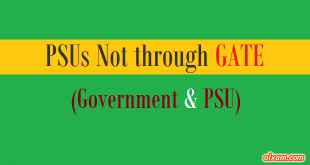 Non-Gate PSUs / Govt & PSUs without GATE – (2019-2020) – Click Here! * Total posts as per recruitment notifications for the year 2017-18. Here all job notifications are only for btech graduates or above but I need diploma based jobs also.is there any link for diploma based jobs notifications. please provide that link. We are providing engineering diploma based jobs since a very long time. Please check below given link for complete information. At present we are not running any android apps for this website. Whenever we will design and run any app for this website. we will surely notify you all. Need list of psus recruiting engineers not Through GATE. Please check table given in this article. sir i also want the list of exam the without gate exam for cs engineers. PSU – All Information about all PSUs is listed here in a systematic way. Thank you sir. dear sir,plz suggest which book shd i buy between ques bank for psu-GALGOTIYA AND RK RAJPUT? Although Both books are good. But I would suggest you Galgotiya Publication spcially for BSNL TTA(JE) 2016 exam preparation. sir, i got 229 rank general category in GATE 2016 . Iam Naveena .iam 2016 Btech passed out student from Ece branch.please tell me updates of psus notifications. sir I am final year in metallurgy engg. Could you post details about vizag steel SAIL other metallurgical companies which companies do not take take GATE eligibilty ? There is nothing mentioned clearly about final year student eligibility. In this case a candidate must have completed required education qualification at the time of document verification. when i am filling the form they are asking to upload final degree and marksheet..
now, as i am currently in 4 year.i have only marksheet up to 3 year.then what can i do? If they are asking to upload final degree and mark sheet then you are not eligible for this recruitment. currently in 2016 which PSUs are recruiting? i want to know details so that i can apply. Nowadays almost all top PSUs are using GATE score for their recruitment process. So if you want to join these PSUs you have to qualify GATE and score good enough in GATE exam so that you can easily selected against these PSUs posts. Hello sir, Can 3rd year students apply for PSU? Can i get nit or any other public sector. Sir , now iam in 3rd year 2nd sem i would like to get job in psus. i got less marks in 10 th : 6.8 iam from cbse. Can I get email notifictions of advertisement/notificatins of NON-PSU Hiring Exams. Please check below page regularly. We here post all the B E / B Tech level jobs which are without GATE. Can you please mention all those companies which are recruiting in 2016? There are some issues in directing of two sites. first one is SAIL and the another one is DRDO. Whenever, I tried to open them, the same page re-open again and again. I have missed applying for Gate 2016. presently I am in final sem of B.tech-ECE. I believe most of PSU’s recruit GATE score basis. can you guide me for the available options higher studies, internship, job, etc. we do not have campus placements. because i have diploma + degree in mechanical stream. my degree is of three year duration due to lateral entry program. so am i going to face any problem by recruitment through gate because of three year degree course? sir i completed be in civil engineering with 50% marks,could you please list me the name of companies i am eligible to apply for. Sir, what are the fee details for psu…how can i know that?? sir i am little bit confused, in some sites there is written that sail recruitment is on the basis of gate and some sites it is written that sail doesn’t recruit on the basis of gate ,which is correct? Sir ,now i’m prsuing in EN 3rd year, could u tell me how many marks requird in gate for PSUs like as NTPC,BHEL .GAIL etc. II am pursuing my career through ELECTRONICS AND COMMUNICATION and I am in BTech 1st year .Sir am Ielligible to crack GATE through ECE or I should change my field ? What are other exams for which I can proceed? Please add last dates Column separately as its easy for us and saves time by not clicking on old advertisements. Sir I am pallavi , I want to score good in my gate exam. What should I do ? First make a time table for remaining 2 months. Include revision and practice time in it mainly. It’s a must. How good you revise whatever you have studied so far and how good you perform in mock tests. These two things will automatically tell you about your GATE exam preparation. plz send me notification of PSU exam both that is through GATE or not through gate.i.e self exam conducted.in my gmail id. Thanks for comipling this data for us…. It is quiet helpful! I would like to know that are there any alternative exams to GATE,like for MBA we have so many exams… Similarly are there any exams apart from gate?? Also can you plese tell me the tentative dates for drdo and isro notifications..
And please add me to your g+ circle. There are many exams apart from GATE exams. I will soon post that list. UGC NET is also one of the most famous exam same as GATE exam. Even IITs accept their score card for Masters degree program. Here we are posting all kind of information of PSUs not through GATE. I am from automobile engineering department and appearing in mechanical stream GATE 2016. Am i eligible to apply for PSU’s related to mechanical engineering stream???? sir, i am in 3rd year b.tech civil ,how should i start my preparation for gate 2017 frm now? please tell me that is there any application form came of psus through gate or not through gate 2016.
sir reply soon. thank you. Am currently in 7th sem can i apply for psu’s exams? sir there is no date regarding the psu who not take through GATE…..so pls update the notification of upcoming exam. Hii admin..can u pls kind me how i will prepare for npc mains paper .m from mechanical stream…. Sir please tell me the PSU which have their own exam with their date of notification? thanks for updating this information , pls keep posting , you have done fabulous work. very helpful informstion got from this site. here are best study material for GATE exams. Please notify me about PSUs for mechanical engineers. actually I’m getting a bit confused so I request you to please give a reply to my above post. i passed BE but i didnt get my marksheet (RLE). what should i upload while filling the form ? Please check again now BSNL & DMRC links are working because they are recruiting right now. You may check these links and apply as per your qualifications. DRDO & SAIL links will also update as their recruitment for 2015 is open. i have completed b.tech in computer science this year, sir plz help me in knowing the syllabus of DRDO written exam which is not through GATE exam. Always notify me about the PSUS examinations. does any company allow final year b.e. students to appear for the examination ?? i went through the links given but there was no such information provided. Most of the companies / govt organization allow final year candidates to appear in exam. For more details please read concerned company notification. Respected sir, I have completed my b.e. on 2015. Can u recommend some company name that I can give their entrance test. You please visit this blog regularly we post all kind of recruitment notice here which are useful for engineers. Thanks faruk for appreciating our work. please how join mnc company. PSUs doesn’t allow candidates to carry question paper with them. You may search questions on facebook communities/ net. May someone posted few questions there. can final year student apply for the examinations mentioned above ? Yes, If any PSU allow find year candidate you are applicable otherwise not. You will find a statement related to final year candidates. I’m a btech graduate in ECE stream, Can I apply for job whose eligibility is 3-year diploma only ??? Yes you are eligible but if there is a statement in the notification like “engineering graduates need not apply” then you can not apply for such posts. can you tell me whether ONGC is going to recruit through GATE2016 Chemical???? because I am 25 year old, only eligible to apply for ONGC. Please suggest me whether I should prepare for GATE or not. Accordingly I have to plan for MBA Or GATE???? Currently there is no any PSU which is recruiting. Subscribe to our newsletter given at the bottom of the page. We will send you all important updates. Add me in your Google+ circle. check mark “GET NOTIFICATIONS” under “LIKED” tab. That’s it. We post our all updates there. You will get all the updates via notification message to your Facebook account. Dear sir, I would like to know the relation between gate score( i think it is out of 1000) with gate rank and marks obtained . I didn’t understand what it is given in the gate notification. I need an explanation in ur words plz. sir i have qualified MSC in Physics with 85%. will i get job opportunity in PSU s with out appearing gate 2016 exam. if i am able to get which are deps are useful for me. pl clarify. sir i am a student of mechanical 7th sem , so please tell me the exam other than gate including their upcoming form dates so that i can fill and sir also tell the upcoming appliction form of psu’s who conducted their own exams please sir reply soon. thank you. Here we will update all details of a PSU or govt organization whenever its notification is out.